Slovakia is a country which became fully independent not so long ago, in 1993. Till that time it comprehended the Czech Republic. Slovakia got its independence in the result of famous “Velvet Divorce”. Today the independent Slovakia is one of the most well-known regions of health-improving and winter tourism in Central Europe. 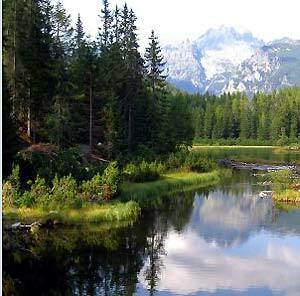 Tatry, the Danube, medieval architecture, caves and medicinal springs are the most popular Slovak places of interest. Slovakia tries not to lag behind its more eminent neighbor the Czech Republic. Slovakia compensates the deficiency in a tourist range of such sights as Prague or Karlovy Vary by the construction of modern entertainment centers, the opening of new tourist routes, hotels and campsites. Family vacations, wellness or spa rest, different kinds of active vacations (rafting, paragliding) are in great favour in Slovakia. The main cities of the country are the capital Bratislava, Koshice, Zilina, Poprad. They offer slovakian guests different opportunities for cognitive tourism. Family vacations in Slovakia remains a priority trend in entry tourism. Summer and winter camps in Tatry and other regions of the country receive ten thousands children and their parents from all the Europe every year. Modern tourism is extremely popular in Slovakia that is proved by different youth festivals and World Student games held in the country. Slovakia tries to attract tourists by its hospitality. It’s felt in everything: beginning from quiet small trains having only two or three compartments travelling along mountain villages and old houses in miner’s settlement Vlkolinec and along quiet streets of a medieval town Bardeiov. Slovakia is “domestic” – this epithet fits this country most of all. Do you know why Lithuania is often called “Northern Italy”? Find the answer on this question at en.litauen-netz.de. Lake Balaton is an ideal place for a family vacation, because every member of the family can find a type of relaxation, which will suit him/her the best. The area surrounding the lake is full of summer cottages, villas, holiday homes and hotels. For more information, check www.hungarian-sea.com.